Contributors: Danny P. Barbare, Roxanne Hoffman, David S. Pointer, Elizabeth Chapin-Pinotti, Michael Aaron Casares, J.P. Christiansen, Christa Pandey, Franklin Metro, Matthew Nadelson, Scot Siegel, Mitchell Waldmen, Thom Moon Bird, Chevaltierre Nabil, Sal Treppiedi, James Brush, Elzy Cogswell, Claire Vogel-Camargo, and Mikel K.
This fine menagerie of writers present a spirit of pride, concern, and honor to the American way of life and that which it once stood for. 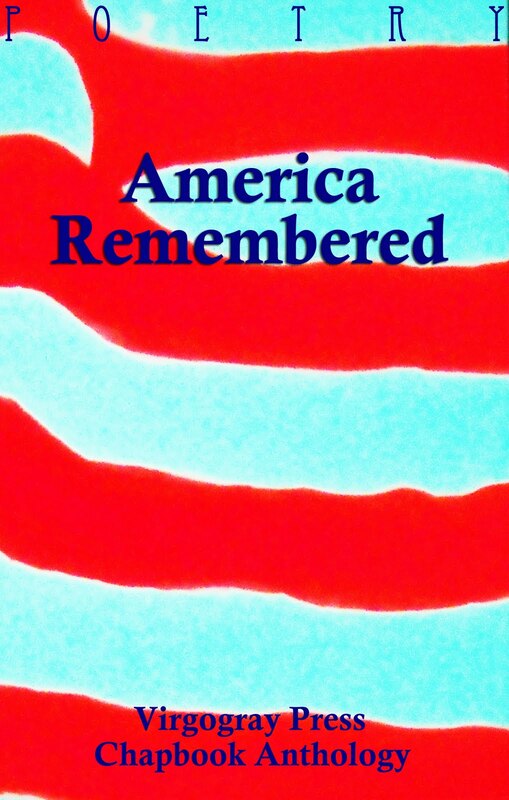 These poems evoke many images, ask many questions and proffer answers, and affirm commitments to what it means to be American and the many freedoms that are entitled. Contributors include: Danny P. Barbare, Roxanne Hoffman, David S. Pointer, Elizabeth Chapin-Pinotti, Michael Aaron Casares, J.P. Christiansen, Christa Pandey, Franklin Metro, Matthew Nadelson, Scot Siegel, Mitchell Waldmen, Thom Moon Bird, Chevalterre Nabil, Sal Treppiedi, James Brush, Elzy Cogswell, Claire Vogel-Camargo, Mikel K. $10.